14th Aug 2009 - The start of the English apple season! The first edition of The Journal coincides nicely with the start of the English Apple Harvest. This is a time of great emotion for all of us in the Apple trade. 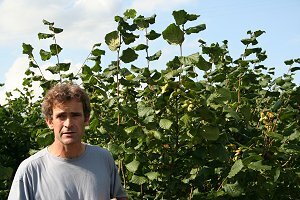 After a summer of routine orchard tasks, all geared to producing a successful crop, we are now at the eleventh hour before the main harvest period. Our concentration is focused on critical aspects of our impending heavy workload, have we assessed our crop accurately for yield and quality? This governs all the associated factors; have we enough pickers and harvest bins, are our cold stores and all our machinery, tractors, trailers, picking trains, fork lift trucks etc in good working order and have we sufficient picking buckets clean and fit for purpose? As harvest draws nearer our emotions are tossed around by anxiety, if we feel optimistic we are often brought back to reality when our marketeers price forecasts are known. Its easy to be pessimistic when we learn that our hoped for increase in net prices is likely to be no more than last year and sometimes less, especially as we try to absorb the increased labour and other associated costs. 'In these difficult economic times what maybe is good news for the consumer is often a disheartening time for the grower. But we need each other, the price equation just seems a bit unfair to us with the grower making do with the 'leftovers' after our Supermarkets have had their profit and all our marketing costs have been deducted! But we press on hoping we will be the exception and on our farm we will have the perfect format, a higher than expected yield of good quality fruit, a strong demand for our important varieties and a fair price. In achieving a profitable return the quality of our workforce is critical, more now than ever before. 'Our supervisory staff are key personnel as they, along with adequate training for pickers, are vital components in ensuring that as near as possible, only fruit with a saleable value above all the ongoing costs incurred from point of harvest find their way into the picking bin. Each 1% of unmarketable fruit will reduce the value of our crop significantly.' Growing a crop is expensive, but from the harvest point onwards costs escalate. Approximately 30% of cost accrues from growing the crop to point of harvest, with 70% gobbled up by harvesting, storage, packing, packaging and marketing costs; any unmarketable fruit and even fruit with a low value, for example only suitable for juice, becomes a negative value. There are many, many things to think about, not least will the weather be kind to us; please God, no late hail to destroy our crop and hopes for another year! I remember well after a difficult time following the loss of my father in 1975, the drought of 1976 and the consequences of drought related stress on the trees in 1977, ie. a miniscule crop, then what joy I felt, floating on air in June of 1978 with an excellent crop across the whole farm, 'this must be my year' I thought, only to be brought violently to my senses as disaster struck at 5pm on a friday in late June and in just a few minutes 60% of all the apples on the farm were hit by hail. Back then it was possible to sell the slightly damaged fruit as Class 2 with some value, but in todays world 30 years on Supermarkets demand near perfect appearance and most hail damage renders the crop only suitable for juice. 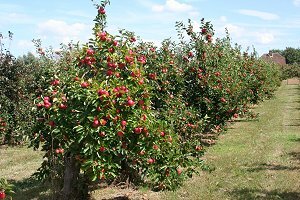 Selective picking of the undamaged fruit is rarely cost effective and it does not end there as the fruit must be cleared from the trees/orchard or next years harvest potential will be seriously affected by tree stress and disease from rotting fruit on the orchard floor. The value of juice fruit rarely exceeds the cost of harvesting this hail damaged fruit. Its just hard disheartening work with no opportunity to put things right for another 12 months! All apples spend some time in a cold store, even early apples need chilling before despatch. Main season varieties will be stored for several months in order to maintain a supply of English Apples accross our season so we sample the fruit intended for long term storage to assess storage potential, as not all will store well as storage life depends on many factors. The stores need to be mainained and tested for efficacy. While we are engaged in these activities, The Ashes Tests are still in progress and while we do our best to catch snippets of information from the radio, there is no slipping off for a day at the cricket as we did for that memorable match at Lords! 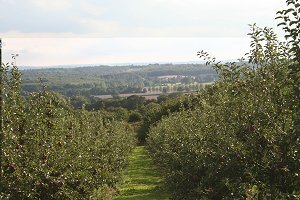 At this moment in time, Discovery, the first English Apples ready for harvest have been in the shops since late July, about a week earlier than last year, a sign we are reminded of Global Warming. 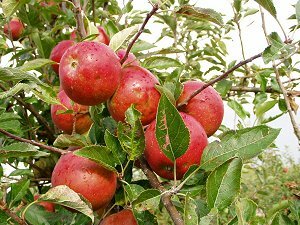 Discovery as a variety is on the wane, but it is symbolic of another new season before we get into more marketable varieties like Worcester Pearmain, Estivale, Early Windsor and others. To finish this week's Journal at a time when we speculate about the potential of our crop, will the yield and quality meet our expectations and prices match our hopes; from my experience, Nothing ever turns out as good as we hope, nor as bad as we fear! Next week: More on pre-season preparations and pictures of training using the most up to date picking systems.